Two-Hole Beads CzechMates Brick, Tile, Lentil, Dagger; SuperDuo, Rulla, Bars, Flowers and More! Copyright Starman, Inc. 2014. Powered by Blogger. Welcome to the blog of Starman, Inc., also known as www.CzechBeads.com, your source for wholesale Czech glass beads, CzechMates, TOHO Japanese seed beads, and more. We are proud to inform bead lovers of the many new and exciting products and events that happen within our multifaceted industry. Who should apply? What are we looking for? 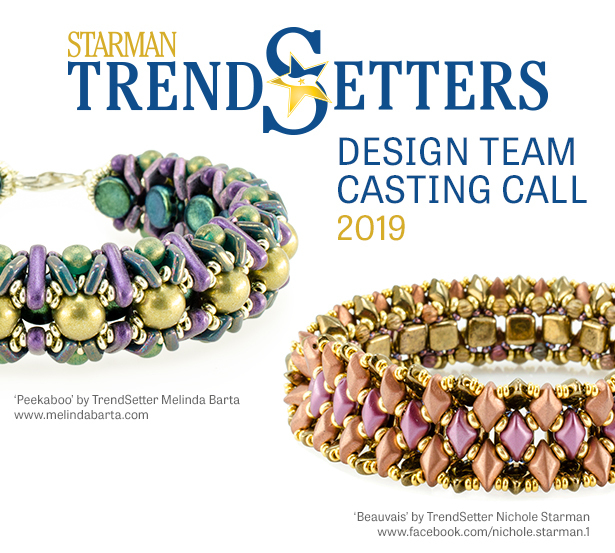 Starman is looking for experienced bead artists and designers from all over the world who love working with quality Czech pressed-glass and Japanese seed beads. Our team includes artists who use a wide range of techniques—including beadweaving, stringing, loomwork, wirework, kumihimo braiding, or other styles. 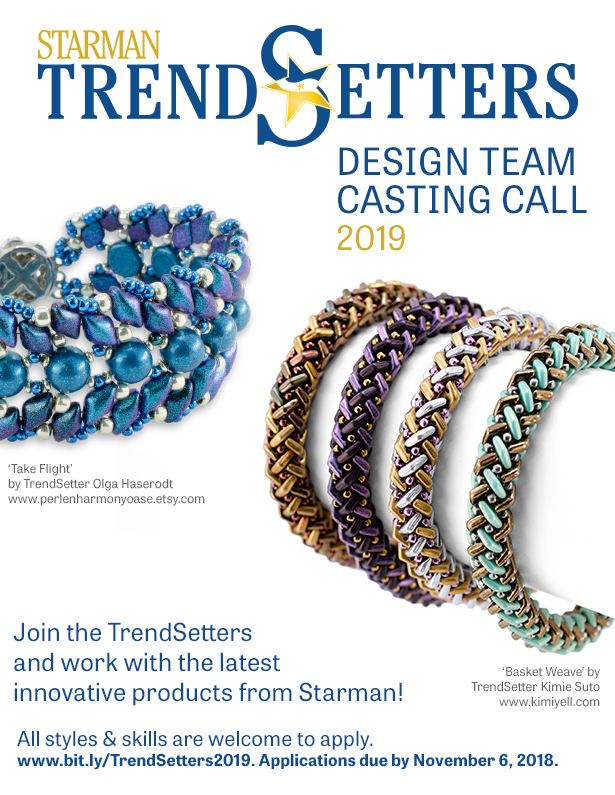 Starman is seeking artists who are willing and able to promote the use of Starman manufactured and wholesale products, including the CzechMates® line of multi-hole beads and TOHO seed beads. Applicants may not be on design teams for any other glass bead wholesaler or manufacturer and must sign a confidentiality agreement upon acceptance to the team. Working with prototype beads before they are available in stores. Being the first to create new techniques for new beads. Samples of selected new products from Starman and TOHO beads. Class sponsorship credits toward major bead events. Worldwide exposure and promotion of your design business. TrendSetter patterns are taught in bead stores all over the world, creating a high level of name recognition. 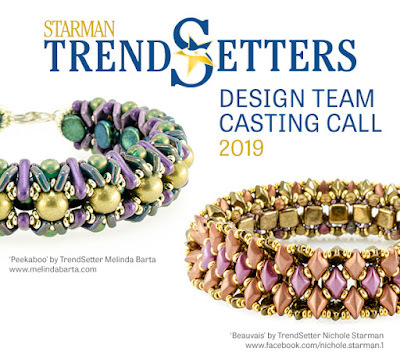 TrendSetter jewelry is prominently featured in Starman international advertisement campaigns. Make connections with distributors of Starman beads who want to feature your products and classes in their stores. Print advertisements and marketing material distributed industry-wide. Introductory 'Take and Make' patterns available online to beaders everywhere. Intermediate 'Pattern of the Month' class and kit patterns distributed to authorized bead stores royalty-free. Online advertisements and social media. Breaking the confidentiality agreement or non-compliance of duties will result in the loss of TrendSetter title and benefits. Applying is simple: Just show us your work! You can send us anything you would like us to see, including an artist resume, list of publications, links to your website, blog, or other places there are images of your work. Email your submissions to TrendSetters@StarmanInc.com by Tuesday, November 6th, 2018. Team members are selected by a panel of judges at Starman. We strive to create a dynamic team of artists that represents the many popular beading styles from around the world. Not being selected should not be considered a critique of one’s work. Applicants will receive a response in late November 2018. Selected TrendSetters will hold their title from the time their completed confidentiality agreement is received through December 31, 2019.